Naval Clearance Divers are the Australian Navy's Special Operations units. While there is sufficient debate about their "Special Forces" status to omit them from SOCAus control, their capability, training and selection warrant such a distinction. Clearance Diving Teams (CDTs) are very similar to the old American Underwater Demolition Teams (UDTs were merged with the SEAL teams in 1983), and in fact used to work with them in Vietnam. 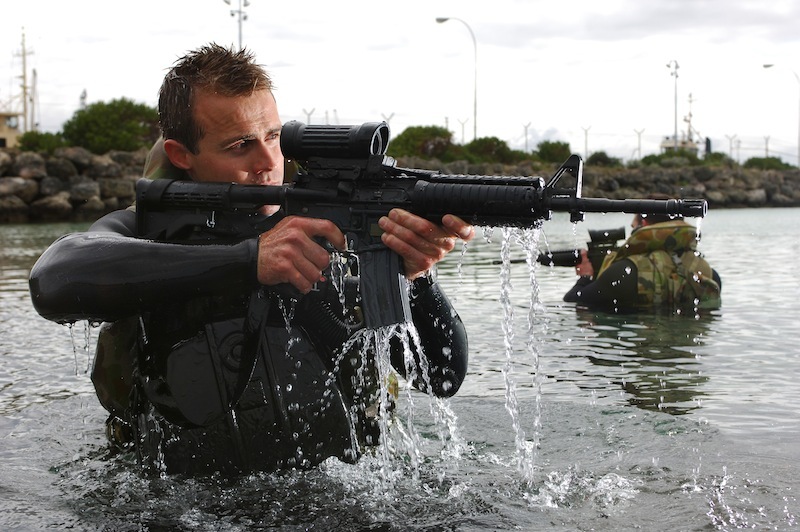 They undergo very lengthy training program (longer than the US Navy SEALs BUDS by several months) and are trained in both diving and combat operations. The CDTs are organised into 4 task elements: Headquarters, Mine Counter Measures, Maritime Tactical Operations, and Underwater Battle Damage Repair. They are capable of deploying separately or in combination with other elements of the ADF. The very detailed Australian Navy site, gives some great information on the CDTs (click here). In summary, CDTs operate in environments up to 54 metres deep and are planning on expanding this to 90m. They engage in Marine Tactical operations, mine counter measures, and underwater battle damage repair. For the Marine Tactical Operations (MTO) they are well trained in small arms, escape and evasion, combat survival and various insertion techniques including parachuting (article on MTO exercise is here). This is what makes them SF - they are clearly capable of undertaking "special operations" for the Australian Navy. Moreover, they are well regarded by their SF peers in the Army. They are also well trained in hydrographic reconnaissance and have put this skill to good use during the conflict in East Timor wherein they provided recon data of the ET shoreline and Harbours to planners in Canberra (click here for an article on the CDT recon survival course). the search for, rendering safe or disposal of all ordnance in RAN ships and facilities, including the removal of Improvised Explosive Devices (IEDs). Due to the investment that the Navy puts into potential recruits there is a minimum period of service for both Officers and Enlisted RAN divers of 6 years. Once having completed the SCUBA air course all recruits must complete the Clearance Diver Acceptance Test. If applicants fail here they are required to either change specialties or exit from the Navy. The selection test is two weeks long and is well known to be rigorous but the attrition rate has yet to be officially stated. The following table illustrates the expected level of performance for potential CDT sailors.